BOTTOM LINE: A diverse look at one of modern drama’s most adapted plays is equal parts poignant and ponderous. But maybe he’s not squirming. 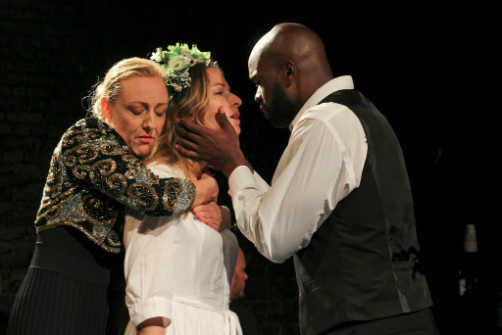 What is most successful about Bastards of Strindberg, the Scandinavian American Theater Company’s final production of it’s 5th anniversary season, is the way it embraces and extends the spirit of Strindberg’s work. In the preface to Miss Julie, Strindberg encourages intimacy and a move away from outdated formalism. The four plays featured in SATC’s production react to Strindberg’s work with a similar attitude. The evening of plays was commissioned by SATC in 2012, commemorating the 100th anniversary of Strindberg’s death, asking two American playwrights (David Bar Katz & Dominique Morisseau) and two Swedish playwrights (Lina Ekdahl & Andreas Boonstra) to write a short play responding to Miss Julie. Henning Hegland and Alicia Dhyana House’s direction connects the four pieces within the frame of the Midsummer Eve’s celebration, with varying degrees of success. As the play begins with Amy Altadonna’s haunting and mystical sound design (accompanied by a captivating live performance by vocalist and composer Anette Norgaard), the ensemble arrives onstage in a ceremonial dance, inviting the audience into the jubilant sexuality that underlies the evening of John and Julie’s encounter. The nuanced simplicity of Lauren Camp’s choreography in this overture sets a calming, ceremonial tone that is fulfilled beautifully by Kullberg-Bendz’s opening monologue. Katz’s adaptation begins the evening, imagining an empowered Julie that has outlasted Strindberg’s tragedy and through the “magic and madness” of Midsummer’s Eve, reconnects with her younger self, attempting to alter the fateful evening’s course of events. Ekdahl’s highly theatricalized play follows, casting John as an enterprising truck driver, seducing Julie over coffee in a run down restaurant, as the actors alternate between the characters of the play and narrators observing distantly in what might be mistaken as a David Ives take on Strindberg. Next, Mya and Darrin, a black couple on the brink of upgrading their lifestyle, debate the glass ceiling and the differences between the “99 and the 1,” in Morrisseau’s modern critique of class structure and assimilation. Boonstra’s charming and whimsical piece completes the production, satirizing theatrical convention in true Strindberg form, and arriving suddenly at a brief understated return to an original Miss Julie scene between Vanessa Johansson’s Julie and Drew O’Kane’s Jean, the highlight of the performance and a fitting tribute to the timelessness of Mr. Strindberg. There’s a clunkiness to the production that seems to be brought on by an attempt to homogenize four diverse plays into a unified evening, though it’s a strong attempt. A European flair in the music that grounds the play, and develops with the shifting narratives. The restrained domesticity of Starlet Jacob’s scenery provides a dynamic template for each play to live within, and is animated elegantly by Yuki Nakase’s starry lighting. The production helps the plays feel of the same ilk, but the presence of the company onstage throughout the performance, imprecise gestural moments, and underdeveloped interstitial material bridging scenes tend to diffuse the production’s energy, instead of pushing it forward. In the closing moments of the play, Johansson’s Julie provides a commentary on truthfulness in the theater: “Just tell me stories...something I can believe in.” Even when the production is uncertain of itself, Bastards celebrates the richness of Strindberg’s storytelling and reveals new ways of understanding the complexities of Julie, John and Kristin.